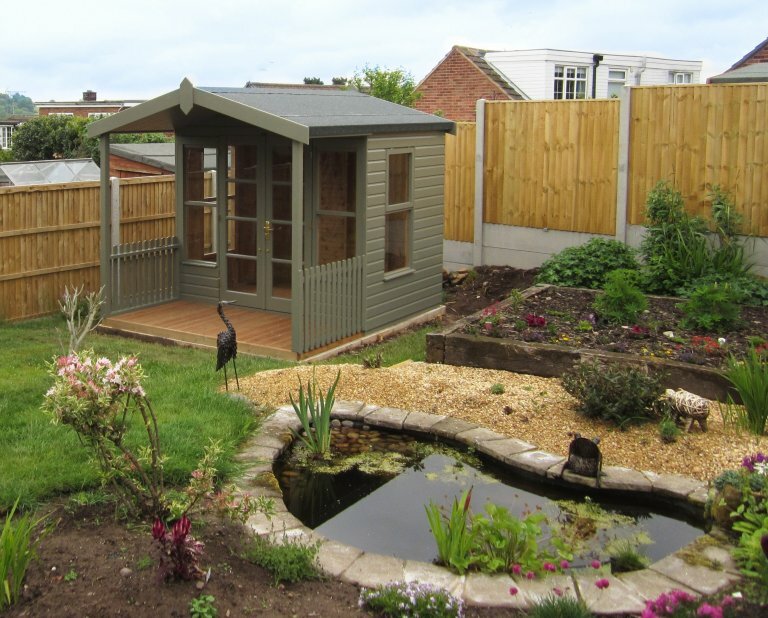 This pretty little garden is now the new home of this Morston Summerhouse in Ravenshead, Nottinghamshire. 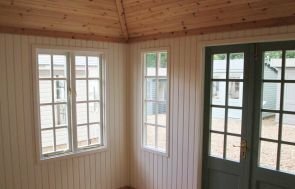 At 2.4 x 3.0m in size, it is a small summerhouse, but the customer can’t wait to turn it into their very own garden retreat to sit and admire their garden from in the summer months. 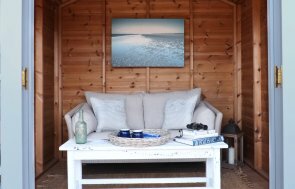 The Morston is unique among our Summerhouses with its 1.2m deep sheltered veranda on the front to give an extra usage option to the customer: they can either sit inside, away from the elements on cooler/wetter days or if the sun gets too hot, or they can sit outside on the veranda to soak up the sun. Heavy duty felt has been used on the roof to provide 12-15 years of waterproof protection, and the summerhouse has been painted in the colour Ash from our Valtti paint range. Valtti is an opaque, multi-layered paint system that has a long re-decoration cycle, and it comes in a range of 15 different, natural colours to choose from. If you are after a painted summerhouse for your garden, we have two different paint ranges to choose from: as well as Valtti, we also offer a range of natural, opaque colours from Farrow & Ball, the UK based paint experts. You can request Paint Samples in the colours you really like to get a true feel for the colour. If you would like to see our extensive range of Summerhouses, or any of our luxury Garden Buildings, you can visit our Nottingham Show Centre. If you have any questions for our team you can Request a Callback, Contact Us or call us directly on 01760 444 229.